The relief of the capitalist world leaders attending the G20 summit in Mexico didn’t last long. Within hours following the narrow general election victory of Greece’s pro-austerity New Democracy party, the rally of share prices on stock markets ended and Spain’s government bond yields exceeded a euro-busting 7%. The capitalist crisis can only inflict further pain and ruination for millions of Greek people and beyond. And as the article below on the Greek election concludes, only the fight for a socialist alternative can end this living nightmare. The outcome of the elections in Greece has left the majority of the population with mixed feelings. On the one hand, there is the victory of the right-wing New Democracy, which conducted a huge campaign of fear and was able to rally all the conservative elements of society. Nonetheless, the parties that explicitly backed the European Union, International Monetary Fund and European Central Bank (the ’Troika’) bailout conditions got less than 50% of the vote. On the other hand, the left-wing Syriza, while not coming first in the election and thereby taking the bonus 50 MPs, still got almost 27%, the highest vote that any left party in Greece has won in the last decades. Alarmingly, the neo-Nazi Golden Dawn won almost 7% of the vote. These results reflect the political tensions that have shaken Greece during the last two and a half years as a result of the economic crisis and the impact of the policies of the Troika. How did New Democracy, associated with causing Greece’s punishing austerity measures, emerge from the election as the largest party? It was one of the most polarised election campaigns, probably the most polarised, since the 1980s. New Democracy (ND), accompanied by EU and IMF officials, local and international media, institutions of the ruling class and all the other capitalist parties waged a huge campaign of fear. «If Syriza is elected we will be kicked out of the euro»… «There will be a social catastrophe»… «There won’t be any medicine and petrol»… were some of the usual phrases used by ND spokesmen. ND managed to increase its vote from 19% in the previous election to nearly 30%, but this was not done on the basis of support for its programme. The question of Greece’s future in the euro and Greece’s debt was the main focus of the ND scare campaign. They used the fear of many workers that Greece is a small economy and cannot survive ’isolated’ from the eurozone and EU. According to polls, a third of the population voted with the euro issue uppermost in their concerns. The ND’s propaganda was ’helped’ by Syriza, whose leaders did not have a clear position on the question, and put forward different proposals, creating confusion among big sections of the electorate. But it was not only the euro question. Syriza was declared as the ’root of all evils’. New Democracy accused Syriza of being linked to terrorism, to political violence and to corruption! This McCarthyite-style witch-hunt was aimed at mobilising the most reactionary elements of the older generation. There was a clear split in the voting results according to age. Among the over 55s, New Democracy and Pasok got more than double the percentage vote than from voters aged 18-54. There was also a clear voter differentiation between the rich areas (for example in Ekali, a rich neighborhood in Athens, New Democracy got 70% and Syriza 6.5%) and the poor ones (in Nikaia-Renti, a working class area, Syriza got around 38% and New Democracy only 17%). Antonis Samaras, the leader of ND, stated after the results that Greece will «honour its signatures» ie continue along the austerity road. Of course, given the huge combined anti-austerity vote, he was also forced to talk about the need for «policies for growth», saying that he will try to negotiate with the Troika a more ’loose’ economic policy. It is clear that a new ND-led coalition will be a government of crisis and austerity attacks and will face big struggles. Greek and international capitalists and bankers do not have a ’humanitarian’ approach to the Greek drama. They will continue to impose brutal cuts policies, but perhaps at a slightly slower pace or in nicer packaging. The new government will continue to provoke huge workers’ struggles and social movements. Now, however, these struggles will have a political perspective, that of bringing to power a left government. This will boost the combativeness and the determination of the masses, even if for the time being, the basic feeling is that of disappointment over the victory of ND. It is maybe the first time in Greek history that the second party in an election has enjoyed bigger celebrations than the first. Syriza made a huge leap, from 4.6% (315,627 votes) in the 2009 elections, to 16.78% (1,061,282) in the 6 May elections, and to almost 27% (1,655,053) on 17 June. This shows the huge potential for the left to grow during a period of crisis. Syriza became a pole of attraction when it posed the question of power, calling for a «left government» and challenging New Democracy, on the slogans of scrapping the bailout memorandum and ending austerity. By doing so, Syriza gave hope to big sections of workers and youth, who saw a way to end the nightmare imposed on Greek society during the last two years. In the run up to the latest elections, there was a clear trend towards Syriza, but it was not an enthusiastic one. Syriza leapt to 27% in the polls just after the 6 May elections. That means that in the one month pre-election period they did not manage to increase that support, while ND was constantly gaining ground. On the one hand, people saw Syriza as the only alternative to punish the «parties of the memorandum». On the other hand, people saw that Syriza did not propose a clear alternative to the implemented policies. The leadership of Syriza kept a clear distance from advocating a socialist programme, which is the only possible way out of the present crisis. They actually tended to water down Syriza’s programme in the weeks before the election and moved to the right. One of the central tasks facing Syriza therefore is to engage in a serious political debate on the programme that they put forward. The basic deficiency of Syriza is that it does not have a rounded-out socialist programme to deal with the crisis. There were radical elements in what it proposed, but these were pared back as the election date approached (for example the demand to «nationalise the banks» became «public control over the banking system» and the slogan «for a government of the Left» changed to «a government of all the Greeks»). Xekinima, the Socialist Party’s counterpart in Greece, which campaigned for a Syriza vote, argued for a clear socialist programme. This included ending all austerity, non-payment of the debt and nationalising the big banks and main planks of the economy under democratic workers’ control and management. Also, part of Syriza’s problem was that different spokespersons were saying different things. ND used that ’multilingualism’ to accuse Syriza of not having a clear orientation. They were not completely wrong in that sense. Syriza took part in the elections with a programme which created illusions that a change of policy can be achieved without clashing with big capital in Greece and Europe. This alienated some of the most politically conscious sections of the working class (who voted for Syriza but had serious doubts), and a fear among other working class voters that Syriza may become a ’new Pasok’, promising a lot of things that it cannot fulfil. Another weakness was that Syriza does not have deep roots in the workplaces and the neighbourhoods. There was an attempt to organise local meetings before the election, and some events saw significant numbers attend, but the overall picture was that the decisions were taken at the top of Syriza. The sharp drop in the votes of KKE (Communist Party), (losing 50% of its votes from 6 May) and the anti-capitalist formation Antarsya (losing 75% of its votes from 6 May) led to Syriza becoming the dominant force on the left in Greece. But can Syriza replace its programme of reformist illusions and confusion with a socialist programme to create a vehicle for the masses to take power? Or will Syriza fail to develop its potential and be in danger of becoming politically ’absorbed’ by the system? Xekinima, which participated in Syriza’s local organisations, intends to play a role in this process, working with the rank and file of Syriza and developing alliances, in its attempt to push Syriza in a leftward direction. The consolidation of the near 7% of the vote by the neo-Nazi thugs of Golden Dawn is an alarm bell to all workers and progressive people in Greece and Europe. Its ’election campaign’ was a mixture of violence, threats and political cannibalism. Its vote came from a part of the population which is desperate and alienated due to the economic and social crisis, without any previous political experience, and politically confused and disorientated. The infamous beating of the KKE MP Liana Kaneli on live TV, which shook a big part of the population, actually seems to have helped Golden Dawn reach that part of the population which seeks ’radical and immediate solutions’ against the whole political system. Its propaganda was also based on the rise of criminality which they try to equate with immigration. Golden Dawn’s position will now be strengthened, and the left must come together to form anti-fascist committees in every city, neighbourhood and workplace to stop their rise. In the months to come, Greece will continue to be the weakest link in the weak EU chain. A new governing coalition of pro-austerity parties will solve none of the country’s difficulties but instead will continue to pauperise the already impoverished Greek people. This will at some stage provoke a massive renewed fightback by the working class. Xekinima conducted a major campaign to support Syriza in the election, and at the same time firmly put forward the need for a clear socialist programme. We will meet the battles ahead with determination, to end this rotten system and lay the basis for a socialist society. 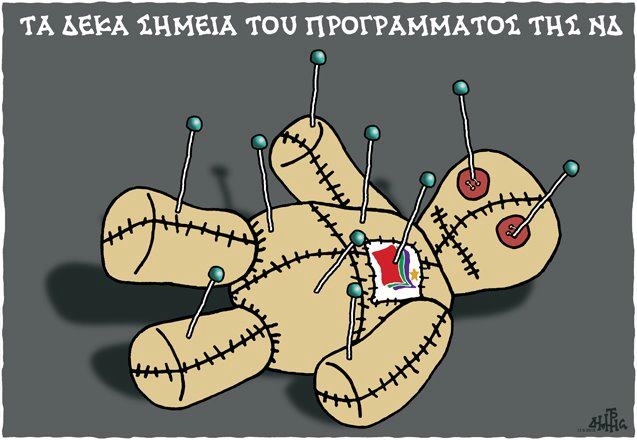 This entry was posted on 22/06/2012, 15:19 and is filed under Άρθρα. You can follow any responses to this entry through RSS 2.0. You can leave a response, or trackback from your own site.